The Massachusetts Institute of Technology (MIT) Short Course Program last July 27-31, 2015 on Modeling and Simulation of Transportation Networks under Prof. Moshe Ben-Akiva was indeed a very intellectually satisfying experience as it provided me with theoretical and practical know how that can be used in our current transport research. Professor Moshe Ben-Akiva is a well-known researcher and book author in discrete choice modelling, especially in transportation analysis and planning applications. Equally capable guest lecturers were Prof. Ennio Cascetta (University of Naples, Italy), Prof. Haris Koutsopoulos (Northeastern University, Boston), Prof. Hani Mahmassani (Northwestern University, Chicago) and Assoc. Prof. Pierluigi Coppola (University of Rome, Italy). The topics included (a) modeling and simulation approaches in transportation, (b) macroscopic, mesoscopic, and microscopic traffic simulation, (c) static and dynamic network supply models, (d) discrete choice analysis, (e) activity based models, (f) integrated land use and transportation models, (g) pricing and travel time reliability, (h) public transportation, (i) economic activity models, (j) logistics choices, and (k) calibration and validation. I intend to share the valuable learnings I gained from this short course program with my students, both in the ungraduated and graduate levels, and also provide further theoretical support to our ongoing research in transportation here at DLSU. As part of the Civil Engineering Research-Based Initiatives & Services (CERBIS), a team of four faculty and eight undergraduate students visited Don Bosco Calauan located at NHA- Southville 7 Site 2, Habitat for Humanity, Brgy. Dayap, Calauan, Laguna on August 14, 2015. This site is a resettlement site of more than 60,000 people displaced by Typhoon Ondoy. The site is managed by the Salesians of Don Bosco with Fr. Salvador Pablo, SDB as the head. The major problem in the site is how to provide jobs and livelihood. The team is composed of CE faculty members – Dr. Andres Oreta, Dr. Bernardo Lejano, Engr. Richard De Jesus (CE Thesis Coordinator) and Dr. Maricel Paringit (CE Community Service Coordinator). The undergraduate students are Nikko Villanueva, Maejann Cuartero, Patrisha Ayala, Jason Alcantara, Eunice Yao, Veya Santos, Masu Eusebio and Martin Benedicto. 1. To meet the person-in-charge of the CHB production and discuss the problems related to CHB production. The main coordinator will be Say Cambosa, asst. of Fr. Pablo. At the moment, the site has the equipment but they do not have the knowledge and testing machines on how to produce the best design of CHB with waste materials satisfying strength requirements. They used trial and error procedure. 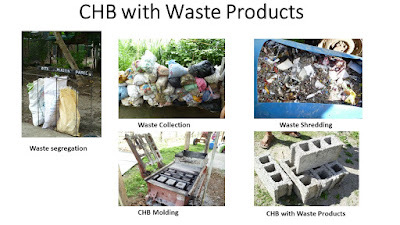 Presently they were able to produce quality CHB with mix proportion – one cement bag, two bags of waste (plastic and styro) and 10 bags of sand). . Possible improvements to the CHB design include sorting of waste materials to better monitor the effect of the different types of waste on strength and durability of CHB. These CHB will be compared to the CHB that will be proposed by the DLSU research group. Cost analysis and marketing strategies will also be considered in the study. Problems related to CHB production such as fire resistance, water absorption, durability and other possible concrete products using waste materials will be also explored by the research group. Dr. Eppie Clark : "The one thing that I know about Dani is his deep care for his family. I was there when he was so concerned about the health of his brother. I feel that he has extended this care to his GCOE family. Thanks Dani." Dr. Lawrence Belo: "It was always fun having Dr. Terante around especially during the Green idol days. He always gives his heart out whenever he performs and he was always a crowd favourite. We will miss ypu Sir Dani. 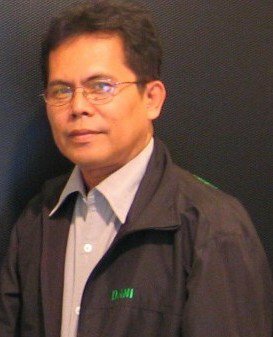 Dr. Nilo Bugtai: "Dani is a good friend... he died just too soon and young. My condolences and prayers to the whole family and loved ones, May eternal light shine upon him and he may rest in peace!" Dr. Yolanda Brondial: "Words are not enough to express my sadness over the early demise of a very dear friend and colleague Dani Terante. Our friendship started when Engineering Science Dept. still existed. Art Gagelonia, Dani and I taught Mechanics ( Statics and Dynamics) and Strength of Materials almost every semester/term until we were absorbed by the Ch.E. Dept. Our fun, laughter, jokes almost always filled the faculty room and Dani was adopted by the Ch. E. Faculty . Lord, we humbly commend to you Dani Terante, whom you loved so much with great love. Now that you have freed him from all the evils of this earth, bring him into your paradise where there is no more grief or mourning or sadness but peace and joy with Jesus , your Son and the Holy Spirit forever." Dr. Raymond Tan: "Condolence to the family."